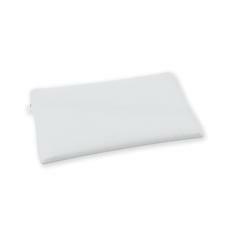 This Babyrest Cot Pillow is designed to provide maximum comfort while keeping to the right level support inside this pillow is a foam core which maintain this level at all times. A 100% cotton cover with the following dimension: 560mm x 330mm BabyRest premium quality products are made in Australia with your baby 's safety as a priority. Our innovative products are made with an emphasis on comfort, support and breathability, to ensure your baby sleeps soundly always. This is our traditional pillow, designed by a mother, which we have been producing for over 30 years. Perma Guard treated to inhibit mould and bacteria, making it non-allergenic and anti-dust mite. Breathable thermal bonded polyester outer layer for extra comfort.